As many of you know, I am mostly vegan. However, I do occasionally eat some seafood. 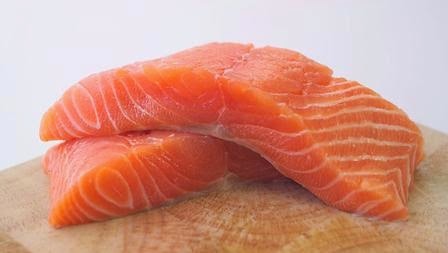 When I do, I like to have a piece of fish and quality salmon is one of my favorites. Seeing some fresh, wild King Salmon did it and I picked up some for dinner. I have been playing with this recipe for quite awhile after seeing a similar one on the web. The original recipe didn't quite make sense to me as it seemed to missing some key ingredients to really give it an authentic Vietnamese flavor. In addition, it had far too much sugar for my taste, so I started modifying and I believe the end result is really good and quite easy to make. 1 1/2 lbs of fresh salmon in two pieces. You want to find thick pieces, so they will roast up well and stay moist. The picture above is a good size. 2 Tbsp Coconut Oil, heated slightly until it turns to oil. The microwave for about 30 seconds is perfect to accomplish this. 3 Tbsp Low Sodium Soy Sauce, this is important as it can be quite salty otherwise. Take a baking sheet and line with aluminum foil. Brush a small amount of the coconut oil onto the lined baking sheet, so the fish will not stick and place the fish skin side down and brush with the additional coconut oil and then sprinkle with the salt and black pepper. Set aside and prep your sauce ingredients. Preheat the oven to 425 degrees and place the salmon into the oven for 12-15 minutes. While the salmon is cooking begin your sauce. Put all ingredients into a small saucepan and bring to a soft boil, then reduce heat so the sauce is just simmering and stir until the sauce thickens. It needs to reduce by at least half. Remove from heat and set aside. When salmon is done, remove from the oven and brush lightly with the sauce, making sure to get a few pieces of the shallot and chili, then allow to sit for 5 minutes. Garnish with the cilantro, green onion and serve with lime wedges and rice or sides of your choice.